Occasional light rain. High 51F. Winds NNW at 10 to 20 mph. Chance of rain 80%.. The Cubs quickly rescheduled Sunday's postponed game against the Angels for June 3, but it won't come soon enough for suspended shortstop Addison Russell. Russell's return from a 40-game suspension for violating Major League Baseball's domestic-violence policy now can't happen until May 3 at the earliest, pending his completion of a mandated program and the Cubs' decision to activate him. And that would line up Russell to return against the rival Cardinals at Wrigley Field instead of May 1 in a more subdued environment in Seattle. Manager Joe Maddon admitted "a soft landing" in Seattle would have been "nice" for Russell, who served 12 games of his suspension at the end of last season. But Maddon said he believes Russell can handle any potential distractions. Maddon communicated with Russell last weekend, adding "he's doing great." 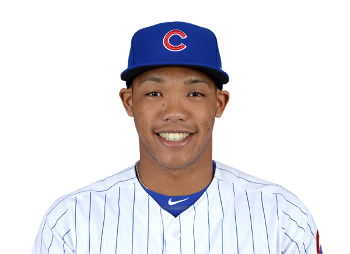 And should Russell be reinstated by the Cubs, he would return to shortstop with Javier Baez moving to second, Maddon said. The rescheduled game will be telecast by WGN-9 and start at 3:05 p.m., and tickets from the April 14 game will be honored. Mobile tickets via the MLB Ballpark app will automatically be updated with the rescheduled game information. The replica Wrigley Field Statue giveaway will be distributed to the first 10,000 fans. Maddon was happy the game will be played relatively soon because of the threat of more rainouts. Last season the Cubs had a major-league high nine postponements and a stretch of 30 consecutive scheduled game days from Aug. 21 to Sept. 19. "I think everyone learned a lesson," Maddon said. Mike Montgomery set for rehab assignment: Left-hander Mike Montgomery is scheduled for a minor-league rehab assignment Tuesday at Class A South Bend, with an asterisk. Montgomery, who is recovering from a left lat strain, will pitch two innings -- provided his wife, Stephanie, doesn't go into labor. In other medical news, catcher Victor Caratini underwent surgery to remove the hamate bone from his left hand. Caratini is expected to miss four to six weeks. Third-base coach Brian Butterfield stayed in Chicago while he recovers from an illness. Art of the structure: The removal of the home run sculpture behind the alley in left-center field wall at Marlins Park brought a mixed reaction from Maddon, an art connoisseur. "I never was offended by it," Maddon said. "But I always thought it would be better placed in front of a building." The sculpture, named "Homer," was dismantled in the offseason and will be rebuilt on a ballpark plaza. The area where the statue once resided was replaced by an observation deck for fans.